In my article last month ‘The Best Christmas Present for your Future – Become and iPro’, I highlighted the rise of the iPro – those self-employed independent professionals with high-level technical skills. I wrote about their growing numbers across Europe, and how they have acted as a positive counterbalancing force in Euro-damaged countries, such as Spain and Portugal. However, I understand that some professionals may see the iPro as no more than a reconstituted ‘freelancer’, a somewhat pejorative term that conjures up the picture of someone who is a ‘struggler’, someone who only just gets by because they can’t get a ‘real’ job. But this fails to recognise what has been happening over the last three decades, and that freelancers and iPros are becoming an increasingly pivotal and vital component in a world of work where new ideas are very much at the heart of what we do – the 21st Century economy that’s being driven by flexibility and innovation. Instead of dismissing them, their fellow professionals in the corporate sector may do well to start paying more attention to this very dynamic group, and at least be aware of their growing presence. Otherwise their own tunnel vision may blur them to a world of opportunities that they could be tapping into themselves. So if you haven’t yet explored the possibility of becoming an independent professional, here are some very real reasons why you should. 1. New technologies have opened up many niche markets. These are filled with enthusiastic consumers who want to be served by companies that understand them and can meet their needs. Large organisations, with their sclerotic bureaucracies, find this hard to do because they can’t apply the necessary or appropriate resources quickly enough. Freelancers release even the largest companies from the constraints of their own internal resources. In other words, they create a new capacity that wouldn’t otherwise be available except by the recruitment of full- salaried staff – something which companies in tight, cost-critical markets aren’t inclined to do. That means they will have an increasing requirement for a flexible freelance workforce. 2. For large companies, it also removes the risk attached to taking on employees (with all their attendant legal requirements and contractual obligations in the first place), and having to pay out more associated costs when they find out they no longer need them. This is one of the reasons why corporates are not always quick on their feet. On the other hand, taking on iPros effectively ‘de-risks’ a company’s investment in human capital, because it allows them to get the workforce, talents and skills they need when they need them without any legal or cost consequences. While this ‘brave new world’ may seem scary to some, for the freelancer or iPro a major benefit of course is that they are able to work for whom they want to, when they want to. This puts them in total control of their career, their work/life balance and how they progress in business. 3. By adding to their core skills and building experience by working for wide range of companies, iPros are effectively refreshing their ‘USP’ continuously, so they are able to offer a ‘unique package’ to prospective clients. This may include knowledge and abilities that are not be available in-house, where employees don’t have the opportunity to learn at the same rate, or to acquire the ‘tangential understanding’ that comes from being a contractor to a myriad of clients. 4. While large corporate organisations and businesses will, by necessity, be required for larger projects, on a day-to-day level they still need to compete against smaller, more dynamic companies who are faster on their feet and have specialist knowledge and skills. If they want to do that, they will need to find ways to reduce barriers to market entry – something that iPros and freelancers enable them to do by providing a flexible resource. Given these drivers, companies will increasingly be looking for the flexible resource they need, and those able to provide it will find themselves in demand, with the ability, through effective marketing, to carve out for themselves a highly successful niche that is no longer dependent on corporate whims. 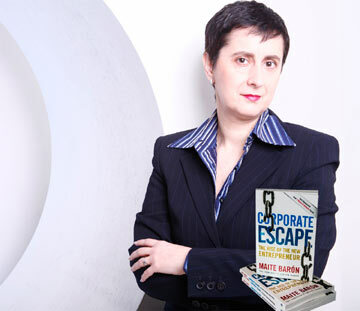 At The Corporate Escape, preparing professionals for success in a future world of work is our passion, so why not discover how we can help you? Download our free guide ‘7.5 Strategies to Thrive in Your Career or Business’ – or better still, book a 15 minute complementary consultation with us to talk through the opportunities that are waiting for you.